Development of paraneoplastic syndromes is a high price which our organism pays for the malignant tumor growth restrain. On the one hand, the reaction of the immune system to onconeurogenic antigens occurrence leads to the nervous system damage, but on the other hand it slows the tumor growth. It is due to the fact that many tumors, accompanied by paraneoplastic syndromes, are of small size and are not always diagnosed in time. In some cases, the tumor is detected only on autopsy. Among the paraneoplastic syndromes, which occur in neurological practice, we should highlight cerebellar degeneration, limbic encephalitis, optic nerve neuropathy, necrotic myelitis, motor neuron failure syndrome, various forms of polyneuropathy, Lambert — Eaton syndrome, myopathy, myotonia, «rigid man» syndrome, dermatomyositis. The problem of further studying of the paraneoplastic process pathogenetic nature has an important perspective as it not only forms new clinical syndromes in neurology, but also restrains the development of malignant tumors. Keywords: paraneoplastic neurological syndromes, malignant tumors, autoimmune process. Objective — to study the features of the clinical course of comorbid diseases in patients with multiple sclerosis (MS). Methods and subjects. The study was conducted by analyzing the anamnestic data of 77 patients aged 19 to 58 years. The criterion for inclusion in the study was a reliable diagnosis of multiple sclerosis according to revised McDonald 2010 criteria, which was combined with at least one comorbidity. Statistical data processing was performed by Microsoft Excel and Statistica. Comparison of the indicators between the groups (according to Student’s criterion) and the correlation analysis (with the calculation of the linear Pearson correlation coefficient) was performed. Results. It was found that the major and comorbid disease was diagnosed in men of younger age, compared with women. In total, according to International Classification of Disease, there were 16 classes of comorbid diseases identified and 61 types of nosologies were diagnosed according the International Classification of Disease version 10 revisions: 26 men and 48 women. Diseases of the digestive system were diagnosed more often in MS patients— 18.80 ± 3.39 %, the bone and muscular system and the connective tissue — 17.29 ± 3.28 %, as well as respiratory organs — 15.04 ± 3.10 %. The prevalence of oncological diseases in MS patients was 44.16 ± 5.66 cases per 100 patients or 25.56 % among all comorbid diseases. Conclusions. In the presence of comorbid diseases in MS patients, 1.73 cases of concomitant diseases were averagely diagnosed in one patient. The prevalence range of comorbid pathology in MS patients was the following: osteochondrosis — 15.58 cases per 100 patients, gastroduodenitis — 11.69 cases per 100 patients and maxillary antrum cysts — 9.09 cases per 100 patients. Keywords: multiple sclerosis, comorbidity, concomitant diseases. Objective — to investigate the effects of rivastigmine on the clinical and electrophysiological characteristics in Parkinson’s patients with cognitive impairments. Methods and subjects. The study included an examination of 41 patients with Parkinson’s disease (Hoehn — Yahr 2.5 — 3.0) with mild cognitive impairments or dementia. Some patients (n = 21) underwent an additional course of rivastigmine (Rivastigmine Orion, Orion Corporation, Finland) during 12 weeks (3 — 6 mg/day). We used Unified Parkinson’s Disease Rating Scale, Mini-Mental State Examination (MMSE), Montreal Cognitive Assessment (MoCA) and Frontal Assessment Battery (FAB). For registration of cognitive event-related brain potentials, two-stimuli oddball paradigm was used. Localisation of brain activity sources was performed with sLORETA. Results. After a course of rivastigmine we found the significant (p < 0.05) improvement of cognitive functions by scores on all outcome scales — MMSE, MoCA and FAB. Besides, we found the increase of the event-related potentials during cognitive load. Amplitude of N2-P3 component increased widespread in the fronto-central neocortical areas mainly of the left hemisphere. N2 peak latency decreased in the frontal, temporal and occipital areas of the left hemisphere. Using sLORETA we revealed a significant increase of the activity of additional N2-P3 generators located in the left inferior and middle temporal gyrus and right precentral gyrus. Conclusions. The main electrophysiological marker of treatment effects of cholinesterase inhibitors in patients with PD and cognitive impairment is decrease in the latency period of N2. These changes indicated the increasing of speed of the early attentional processes and can be associated with activation of additional networks in the temporal lobe of the left hemisphere. Keywords: Parkinson’s disease, dementia, cognitive ERP, cholinesterase inhibitors, rivastigmine. Objective — to investigate the correlation between the level of Ser-Pro-Cys peptide of patients with multiple sclerosis (MS) and the clinical course of this disease, in terms of modern perception of retroviruses impact on the development of the pathological process in MS.
Methods and subjects. The study involved 61 MS patients and 20 healthy individuals aged from 19 to 57 years. Methods of research: clinical — analysis of complains, history anamnesis, general and neurological examinations. Ser-Pro-Cys peptide was identified in the blood serum by using two-dimensional thin-layer chromatography and mass-spectrometry. Results. Ser-Pro-Cys peptide was excreted in 100 % of MS patients, while nobody from the control group had it. The level of the investigated peptide was significantly higher in MS patients even at the disease onset and was held high in all types of disease course, comparing with the results of the control group. At the same time, it has been established that the greater total number of disease relapses was, the higher the concentration of Ser-Pro-Cys peptide in the serum of MS patients was. Conclusions. The detection of Ser-Pro-Cys peptide in the blood serum of examined individuals is a highly specific diagnostic sign of MS. High activity of the disease in patients with a significant level of this peptide correlates with the information about proinflammatory and myelintoxic activities of the human endogenous retrovirus-W protein, the probable fragment of which is identified as Ser-Pro-Cys peptide. 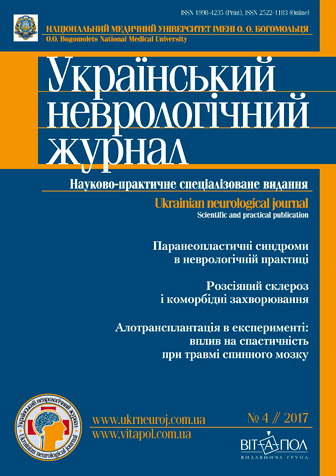 Keywords: multiple sclerosis, biomarkers, clinical course, retrovirus, Ser-Pro-Cys peptide. Objective — to evaluate effectiveness of thioctic acid as a part of integrated therapy of ischemic stroke (IS) in patients with pre-existing diabetes mellitus (DM) on physical recovery and cognitive functions in three months after the onset. Methods and subjects. 82 patients (66 — 84 years old) with acute IS and pre-existing DM were randomized into two groups — Thioctic and Standard. 38 patients of Thioctic group received thioctic (alpha lipoic) acid (TA) and standard IS therapy. 44 patients from Standard group received only standard IS therapy. The Control group contained 22 patients with IS and no carbohydrate metabolism disorders (received only standard IS therapy). The severity of IS in all three groups was moderate. Therapy continued through early IS recovery period. All patients underwent comprehensive clinical and neurological examination. The IS diagnosis was verified with cerebral MRI. Scoring by National Institutes of Health Stroke Scale (NIHSS) was performed on days 1, 7 and 14 from the IS onset. The functional status of patients was determined by the Barthel index on days 14 and 90. The degree of cognitive impairment on the Mini–Mental State Examination (MMSE) scale was assessed on days 1, 14 and 90. Results. TA as a part of integrated therapy for IS improves functional recovery of patients as well as increases the number of patients who are independent in the daily life activity. In the early recovery period, TA helps preventing the development of post-stroke cognitive impairment and improves cognitive functions. In three months after the IS onset, TA improves cognitive functions (MMSE score significantly higher in Thioctic Group vs. Standard Group and Control, p < 0.05) since those groups demonstrated minor cognitive improvement according to MMSE. Conclusions. Use of TA in acute and early recovery periods of moderate-severity IS improves functional recovery and cognitive functions in patients with IS and pre-existing DM in 3 months after onset (as compared to standard IS therapy). TA increases treatment effectiveness, improves the results of rehabilitation and increases the number of patients who are independent in the daily life activities. Further study of TA impact on cognitive status of IS patients with pre-existing DM is recommended. Keywords: ischemic stroke, diabetes mellitus, functional recovery, cognitive status, thioctic acid. Objective — to compare dynamics of the paretic limb spasticity level after spinal cord hemisection, adult olfactory bulb tissue transplantation (OBTT) and fetal cerebellum tissue transplantation (FCTT). Methods and subjects. The empirical material obtained in a number of previous studies was used as the primary data [V. I. Tsymbaliuk et al., 2016, 2017]. Animals — white male rats (5.5 months, 300 g; 1 month, 50 g). Experimental groups: LSH — spinal cord left-side hemisection (LSH) at the Т11 level (n = 16); OBTT — LSH + immediate homotopic OBTT (n = 34); FCTT — LSH + immediate homotopic FCTT (n = 15). Monitoring of the spasticity index (SI) was performed by Ashworth scale. SI weekly gain (VSI), gain acceleration calculation, as well as statistical analysis were performed within the software package Statistica 10.0. Results. During the first month of observation, the values of SI in the FCTT group were maximal, reliably prevailed SI value of the LSH (during the 1 — 3rd week) and OBTT (during the 1 — 6th week) group. The SI values of the FCTT group were significantly lower than the value of the LSH group at the 2nd week of observation. The most significant difference in the dynamics of the SI was observed during the first (the value of VSI of the FCTT group prevailed) and second (the value of VSI of the LSH group prevailed) week. Since the 2nd week of the experiment, the significant differences in the dynamics of the SI in direct comparison of the FCTT and OBTT group VSI were not detected. Conclusions. The transplantation of the tissue containing precursors of glutamatergic (fetal cerebellar tissue) or GABA-ergic (adult olfactory bulb tissue) neurons into the spinal cord trauma area has the opposite effect, which confirms the assumption regarding the role of these mediator systems in the spasticity formation. Keywords: spinal cord injury, posttraumatic spasticity, adult olfactory bulb tissue transplantation, fetal cerebellum tissue transplantation, gain of motor function and gain acceleration, dynamic analysis.